The latest episode of the MiCare Champion Cast, the MHA’s podcast on issues surrounding healthcare, provides updates on new opioid legislation and information on the Michigan Automated Prescription System (MAPS). The episode features interviews with Paige Fults, MHA director of advocacy, and Kim Gaedeke, acting deputy director, Michigan Department of Licensing and Regulatory Affairs, about opioid legislation that will be taking effect in the coming months. They also provide information on MAPS, which physicians will soon be required to review before they prescribe a controlled substance schedule II-V to a patient. Robert Nolan, DO, director of emergency medicine at Lakeland Health, St. Joseph, is also featured on the episode, and he shares information for patients and steps his hospital is taking to improve clinical practices around opioids. The episode can be heard on SoundCloud or iTunes. To listen on a mobile device, subscribe to the “MiCare Champion Cast” with a podcast app, such as Apple podcasts, Google Play, Stitcher and more. The podcast is part of the statewide #MiCareMatters campaign, launched in 2017, which aims to build a network of citizens — “MiCare Champions” — who will be called upon to engage in advocacy efforts to protect access to affordable healthcare services in Michigan. 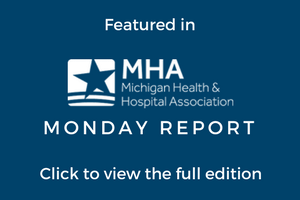 Past episodes have featured interviews with other MHA members and covered topics including the Affordable Care Act, sepsis, Michigan’s auto no-fault insurance system, health equity and more. For more information, visit micarematters.org. For more information on the opioid legislation, contact Paige Fults at the MHA. Members with questions or who would like to submit ideas for future podcasts should contact Laura Hall at the MHA. Additional resources are available online on the MHA's Opioid Epidemic webpage and LARA’S MAPs webpage.